At 11:02 PM on Saturday, Rew Fire Department & Smethport Ambulance have been dispatched to a motor vehicle accident near 2575 Route 46. Driver is confined. At 10:30 PM on Saturday, St. Marys Police & Ambulance were dispatched to Lewis Street to assist a 31 year old male who was struck with a shovel in a domestic incident. FNN Article © 2018. Images provided by Shawn Carey © 2018..
BLOSSBURG, PA - Around 11:40AM on Friday, 23, 2018, Blossburg fire units and an ambulance were dispatched to a two-vehicle accident in Blossburg. According to Blossburg Fire Chief Shawn Carey, the red SUV did not stop at the intersection and was t-boned by the gray SUV. The impact was hard the red SUV ended up on its roof. The roadway was blocked by crash for a short period of time. The vehicles were removed from the crash scene around 12:30PM. No injuries were reported in this accident. At 10:08 PM on Saturday, Big Elm Fire Department has been dispatched to Rt. 549 for traffic control at a motor vehicle crash. At 9:27 PM on Saturday, Wellsville Fire Dept. has been dispatched to Jones Memorial Hospital for multiple fire alarms going off. 9:45 PM--Fire Dept. & Ambulance respond to Jones Memorial for smoke in the basement. 10:02 PM--Fire confined to overheated motor on hydraulic pump is out. Turned over to maintenance department. At 9:18 PM on Saturday, Coudersport Ambulance has been dispatched to the 100 block of East Second Street at the Potter County Jail for a patient with chest pain. Once again, the Small Town Christmas Parade was a success. Thanks to all who helped plan and to those who participated. Here is the first set of photos! At 8:27 PM on Saturday, Wellsboro Fire & Ambulance has been dispatched to the area of 1471 Shumway Hill Road for victims of an automobile accident. Caller reports vehicle is over an embankment in the woods. He was able to get out and climb back to the roadway. A young child is still in the vehicle. Michael W. Stoddard, 65, of Duke Center, formerly of Bradford, PA, died Friday November 23, 2018 at his residence. Funeral arrangements are incomplete and will be announced by the Hollenbeck-Cahill Funeral Homes Inc.
Rev. Randall Walter Headley, 70, of Port Allegany, PA, died Saturday (November 24, 2018) at UPMC-Cole, Coudersport. Arrangements are under the direction of the Hartle-Tarbox Funeral Homes, Inc., Port Allegany, are incomplete and will be announced with a full obituary. Update from Bear check for those that ask! Someone hit a deer (buck) in front of my house,while I was cleaning up their mess I found a key in a magnetic key case, on rte 44 one mile north of Coneville. If they call me at 814-698-2176 they can pick it up at my house. The Coudersport Craft Show Team! Thanks to Empereon volunteers for helping today! And a huge thanks to all our Vendors!!!! A friend of ours lost these keys in Port last Sunday. Some where between Open Arms Church in Port and Johnston's tools. Get your Tickets For The John & Doris Rigas Free Holiday Concert Featuring "Shattered Glass"
John Rigas is celebrating Christmas. Don't forget to pick up your tickets for the John and Doris Rigas Holiday Concert being held next Saturday, December 1 at 7:30 at the Coudersport Consistory! The tickets are FREE and are available at Buchanan Brothers Pharmacy, Zito Media, Wending Creek Farms Tree Store, Coudersport Theatre, and Kaytee's in Coudersport; at Fox’s in Shinglehouse; at The Corner Café in Ulysses; and at Perry’s in Austin. 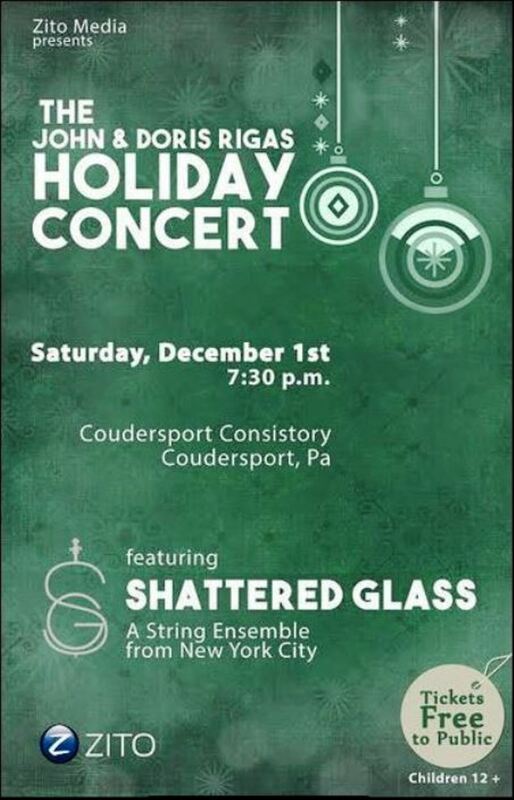 The concert features Shattered Glass, a string ensemble from NYC. Come celebrate the season!!!! 8:30-9:30 Registration& Welcome- refreshment & exhibits along with interactive hands-on Farm Safety Demonstrations. 9:30-10:10 Dealing with Storm Water - Brain Rahm, Cornell University. Heavy rainfall events are becoming more and more common. It is critical for safety and protection of property that we learn how to become more aware of and better prepared for the risks associated with storm water.What can you do and who to call. 10:20-11:00 Whether a Lease Agreement Is Good Depends on What Side of the Hedgerow You are On - Sustainable Agriculture Leases will be addressed by Steve Walker, JD, from the Scolaro Firm in Syracuse with a background in dairy farming. He will talk about the key provisions of a lease agreement and aspects important to a clear understanding between the landowner and the farm operator. Pond Regulations, Site Selection, Construction &Maintenance – Brian Davis, District Field Manager, Cattaraugus County Soil & Water Conservation District. A successful, safe, and enjoyable pond begins with proper site selection, including site characteristics such as availability of water, soils, and topography. Proper planning, design, and construction techniques are important to make sure the pond safely holds water and meets the landowner's objectives. Periodic operation & maintenance will prolong the life of the pond and insure that it continues to provide years of safe, reliable, enjoyable service. Delving Deeper into Lease Agreements – This session will give participants a chance to dig deeper into the topic of leasing with Mr. Walker. Discussion of tax considerations, insurance, termination, maintenance of improvements, assignability, dispute resolution, memorandum of lease, right-of-first-refusal, option to purchase and more will be driven by questions from participants. Soil Health Indicators & Constraints –Cornell Soil Health Lab. Workshop will review the physical, biological and chemical health indicators of soil, how indicators are measured, and the implications for proper functioning of soil. Managing woodlots to control invasive species and other problem plants. - Kimberly Bohn, Ph.D. Extension Educator, Forestry and Natural Resources,Workshop will cover general woodlot management and incorporate invasive species identification and control. 1:30-2:30 Panel Discussion - Landowners and Farmers will share their approach to leasing, using conservation programs, soil health and more. Bring your questions to ask people with experience how they are achieving their goals for their land. Fee: $10.00 per person and includes lunch. Pre-registration also accepted by Phone: (814) 274-8411 ext. 4; Fax: (814) 274-0396 or Email: pccd@zitomedia.net. Pre-registration appreciated by November 28, 2018to assist with plan for materials! Funded in part by the Landowners and Farmers Working Together for Clean Water in the Great Lakes Project of American Farmland Trust with funding from the Great Lakes Protection Fund. Cornell Cooperative Extension is an employer and educator recognized for valuing AA/EEO, Protected Veterans, Individuals with Disabilities, and provides equal program and employment opportunities. Penn State College of Agricultural Sciences research and extension programs are funded in part by Pennsylvania counties, the Commonwealth of Pennsylvania, and the U.S. Department of Agriculture. John W. Snyder, Jr., 79, of Cogan Station, PA passed away Thursday evening, November 22, 2018 at his home while surrounded by family. Born September 20, 1939 in Estella, PA, John Wesley Snyder Jr. “Buzz” to family and friends, was a son of the late John W. Snyder and Marjorie (Boyles) Martin. He was a graduate of Montoursville High School, class of 1956. On June. 16, 1976, John married the former Bonnie Jean Graybill in Williamsport, PA. Together they shared 42 loving years. “Big John” enjoyed his career as a machinist and was employed at Textron Lycoming for many years until retiring in 2001. Following employment, he worked at Sams Club as a door greeter. He appreciated woodworking, bowling, playing darts watching westerns and sports on TV, especially his favorite, the “New York Yankees”. He was a member of Friends Church of Hughesville. Surviving are his wife, Bonnie Jean, five children, James (Lori) Steele of Florida, Terri (Joe) Higham of S. Carolina, Aaron (Cortney) Snyder of Clarkstown, Desiree Snyder (fiancé Mike Selfridge) of Canton, Brian (Missy) Beam of Nesbitt, 16 grandchildren, 3 great grandchildren, a sister, Joyce (Bob) Taylor of Hughesville, several nieces, nephews, cousins and his dog, Josie. He was predeceased by two children, John and Kimberly Steele, five siblings, Wanda Weaver, Beverly Sechler, Robert, George and Daniel Snyder. In keeping with John’s wishes, services are to be private. The Pepper Funeral Home & Cremation Facility in Canton is assisting with arrangements. In lieu of flowers, consider a donation in John’s name to American Cancer Society, 1948 E. Third St., Williamsport, PA 17701 or UPMC Susquehanna Hospice, 1100 Grampian Blvd., Williamsport, PA 17701. Montoursville, PA – The Interstate 80 westbound rest area in Montour County is now open. At 2:14 PM on Saturday, Blossburg & Liberty have been dispatched to Rt. 15 Southbound near MM 166 for a one vehicle crash. The Santa parade has been cancelled due to weather, however, Santa will still be stopping at Pepe's. At 1:15 PM on Saturday, Portville Fire Dept. has been dispatched to 8569 County Road 5 for a structure fire that is already burned to the ground. At 12:30 AM on Saturday, Bolivar & Richburg Fire & Ambulance have been dispatched to Rt. 417 near Phillips Hill Road for a one car crash with three injuries. a few hundredths of an inch. * WHERE...Cattaraugus and Allegany counties. * WHEN...Until 2 PM EST this afternoon. and use caution while driving. Submit ice reports through our website or social media. At 11:54 AM on Saturday, Coudersport Ambulance has been dispatched to Roberts Road for seizures. At 11:42 AM on Saturday, Ludlow Fire Department has been dispatched to Route 6 for a no-injury accident. At 11:28 AM on Saturday, Blossburg, Liberty & Cogan House Substation have been dispatched to Rt. 15 Northbound for a report of a multiple vehicle crash. At 10:51 AM on Saturday, Highland Fire Department and Kane Ambulance have been dispatched to the area of 18991 Route 948 for a one car crash into a ditch with a 60 year old male injured. 11:45 AM--Crash finally found, vehicle is rolled on its side. Roy Roger Baker, Sr., age 70, died Friday, November 16, 2018 at the Bath VA Hospital, Bath, NY. He was born March 8, 1948 in Corning, NY, a son of Howard and Rose (Galusha) Baker. Roy was married to Elizabeth "Lisa" (Smith) Baker for 26 years. He was employed as a truck driver for RC Cola; worked installing oil tanks for Angler Oil; ran a tractor trailer business, did door to door sales of vacuum cleaners for 40 years, and owned Baker's Auto Sales in Blossburg. Roy was a member of Holy Child Catholic Church; enjoyed hunting, fishing, golfing, was an avid bowler and was a driver in demolition derbies. He was a U. S. Army veteran serving in Vietnam between 1965 – 1967. Roy is survived by his wife, Lisa; 3 sons and daughters-in-law, Roy (Annette Morseman) Baker, Jr. of Wellsboro, PA, Mark and Misty Graybill of Jersey Shore, PA, Jonathan Baker of Tioga, PA; 3 daughters and sons-in-law, Heather Elizabeth (Shawn Wagner) Baker of Wilmington, DE, Ashley Marie (Alex Preston) Baker of Mansfield, PA, Kathryn Rose (Chance) Long of Mansfield, PA; 7 grandchildren, Malinda, Kirsten, Keaton, Jaxson, Thomas Roy, Paisyne and Chandler; 3 great grandchildren, Aaliyah, Brantley and Jayse; 2 brothers and sisters-in-law, Howard and Betty Baker of Liberty PA, John and Terry Baker of TN. He was predeceased by his parents, and brothers, Robert, Leland and Edward. to one tenth of an inch are expected. * WHERE...Portions of central Pennsylvania. * WHEN...From 8 AM this morning to 2 PM EST this afternoon. Instructions: The Pennsylvania Department of Transportation and Pennsylvania Turnpike Commission remind motorists to adjust speeds based on driving conditions as winter weather impacts Pennsylvania roadways. Visit www.511pa.com for the latest travel, roadway and traffic conditions. Game is today at 1 PM at Slippery Rock University. At 11:23 PM on Friday, Kane EMS-ALS has been dispatched to Sheffield for a 2 vehicle crash on First Mill Street with a vehicle into a parked vehicle and a vehicle into a house. At 10:45 PM on Friday, Coudersport Ambulance has been dispatched to Roberts Road for seizures. Chunwei, Inc., a Huntington Park, Calif. establishment, is recalling approximately 65,023 pounds of various ready-to-eat and raw meat and poultry products because the products are misbranded and may contain soy, wheat, dairy, egg, and sesame, known allergens, as well as monosodium glutamate (MSG), which are not declared on the finished product label. At 9:36 PM on Friday, Roulette Ambulance has been dispatched to Hansen Hollow Road for a fall victim with a hip & shoulder injury. ice accumulations of a light glaze anticipated. Counties. In New York, Steuben and Chemung Counties. At 18:54 Wellsville Fire Department was dispatched for the request for Wellsville 2 (4 wheel drive Engine) to the scene of a Structure fire in the town of Amity, with only access to off road vehicles. Wellsville 2 (J. Fleischman) responded right after dispatch. Once on scene the Engine went to work as the attack truck. With limited access, water was shuttled in by brush trucks. We operated on scene with Belmont, Friendship, and Scio Fire Departments, Amity Rescue Squad, and the NYSP. Crews operated on scene for hours, and returned to service at 00:00. Special thank you to all who helped pick up frozen equipment and get the Engine back in service. 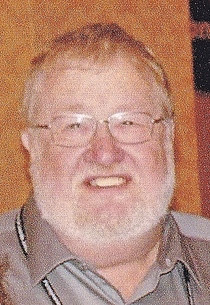 William J. Rothermel, 67, of Forest Ave., Smethport, PA, died peacefully Thursday (Nov. 22, 2018) at his home, surrounded by loved ones. Born July 31, 1951, in Kane, PA, he was a son of William and Mae Cummings Kinney. He was then adopted and raised by his loving grandparents, Beatrice and John Rothermel. On Nov. 23, 1984, in Port Allegany, he married Jean M. Cochran, who survives. William was a graduate of the Smethport Area Jr.-Sr. High School, class of 1969. Shortly thereafter he moved to Buffalo, NY, area and started working at the Gowanda Psychiatric Center. He later moved back to the area where he and Jean helped foster over 20 children with Beacon Light of Bradford. He had been employed as a rural mail carrier, with the US Postal Service, did maintenance for the Smethport Post Office, and worked for McKeirnan Bus Garage, Smethport, before his retirement. He also volunteered with the former Smethport Ambulance for 20 years. He was a member of Mount Jewett Assembly of God. He enjoyed photography and Saturday night at McKean County Raceway, selecting action shots of race cars coming out of the turns. William loved a good joke and was passionate about life. Surviving in addition to his father, William Kinney of Michigan, are four sons, Brian J. (Sabrina) Rothermel, of Newburgh, NY, Benjamin W. (Robin) Rothermel and Joshua A. (Kassie) Rothermel both of Smethport, and Bryan D. (Lori) Greenman of Rew, PA; a daughter, Julie A. Rothermel of Hamburg, NY; 18 grandchildren; two sisters, Holly (Tim) Hettwer and Kelly (Dorin) Denis both of Michigan; and several nieces and nephews. He was preceded in death by his grandparents, mother, Mae Cummings, and a brother, Roger L. Shunk. Friends will be received from 2-4 p.m. Sunday, and from 10 – 11 a.m. Monday (Nov. 26, 2018) in the Hilltop Baptist Church, Gifford, where funeral services will be held at 11 a.m. with Rev. Cam Mealy, pastor of the Mt. Jewett Assembly of God, officiating. Burial will be in Rose Hill Cemetery, Smethport. Celebrating the life of Donald Eugene Bane, 83, Eldred, PA, who passed away on November 20, 2018 at Charles Cole Memorial Hospital. Don, as most people called him, was born in Cameron, WV on April 21, 1935. He was the son of Harry “Monty” Bane and Esta Paulina Stewart. On August 29, 1975, Don, married Pak Sun Duek who survives. Don served our country in both the United States Army and United States Air Force serving a total of twenty-one years. Don specialized in Explosive Ordinance Disposal. Locally, he retired from Pittsburgh Corning Glass Co. of Port Allegany. He was a member of the VFW, American Legion and loved all sports, especially WVU. Surviving in addition to his wife, are two sons; James Bane of Eldred, and Jason Bane of South Carolina, one daughter Eugenia Bane of New Jersey, and three grandchildren; Dylan, Gabriel and Ryleigh Bane. Preceding him in death was his brother Richard Bane and sister, Marie Leffler. Following Don’s wishes there will be no services.